I am so happy to share 3 different projects, using gorgeous stamps and Dye inks from Tubby Craft. 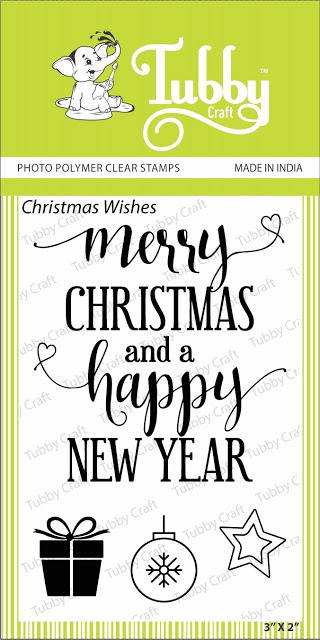 For making these beautiful tags, I have used our newly released stamp sets "Christmas Wishes" and "Bright Day" along with super adorable stamp set "Penguin Love" from our earlier release. 1. 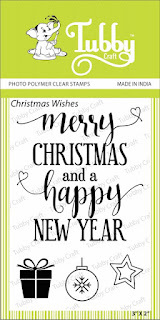 I have done some die cutting using Sizzix machine to cut some tags in different shapes and layered them with pattern papers. 2. Stamped some flowers from "Bright Day" stamp set on white card stock and coloured them using Tubby Craft Dye inks Light Pink and Aqua Blue. Then done fussy cutting for all the stamped elements. 3. Stamped the sentiments using "Penguin Love" and "Christmas Wishes" stamps. For stamping, I have used Tubby Craft Dye inks Jet Black and Imperial Red. 4. 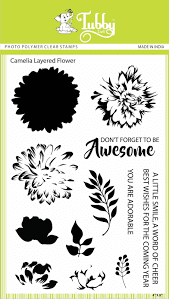 Decorate all tags with fussy cut elements using double side foam tape. 2. 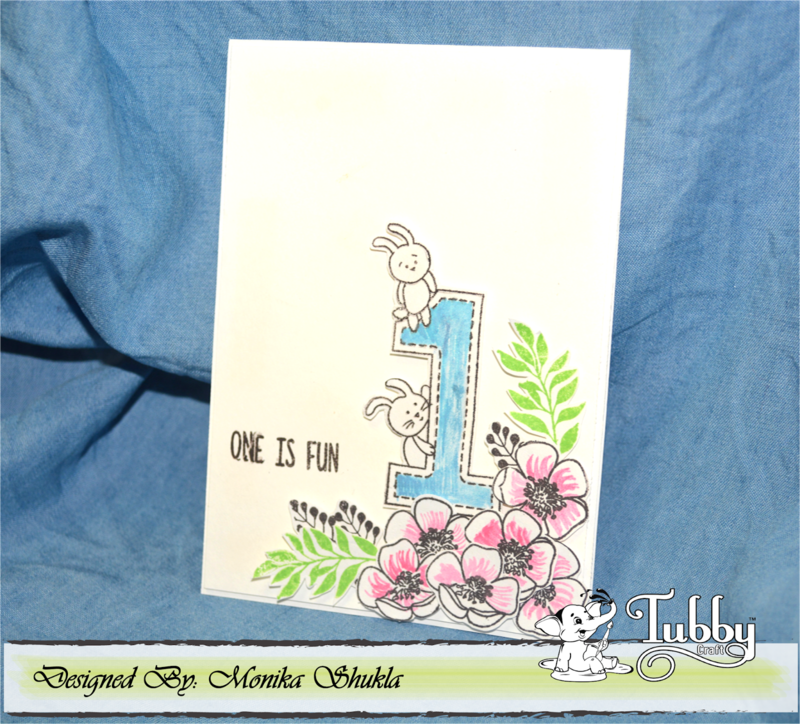 Birthday Card "One is Fun"
Here is super simple and fun card. I love all the numbered stamps from Tubby Craft. So I have used 1 number to celebrate Tubby Craft's 1st Birthday. 1. 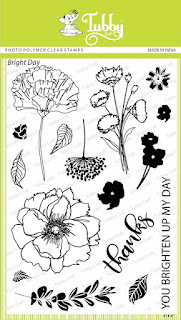 I have stamped some flowers and leaves using "Camelia Layered Flower" and "Buttercup" stamp sets on white card stock along with "One Fun" number stamp. For stamping and colouring, I have used Tubby Craft Dye inks Jet Black, Lawn Green, Aqua Blue and Light Pink. 2. Done fussy cutting of the stamped elements. Then adhered all the fussy cut flowers and leaves to create some layers on the card and added number 1. 3.To finish the card stamped the sentiment "One is Fun" and all done. 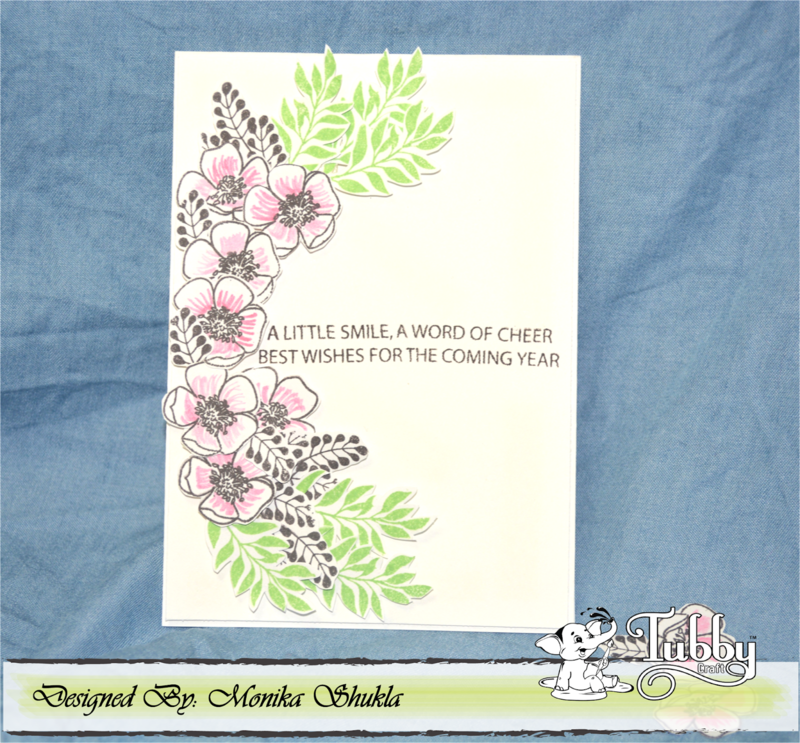 I have used "Camelia Layered Flower" and Buttercup" stamp sets for making this simple and quick card. 1. I have stamped some flowers and leaves using "Camelia Layered Flower" and "Buttercup" stamp sets on white card stock and done fussy cutting. 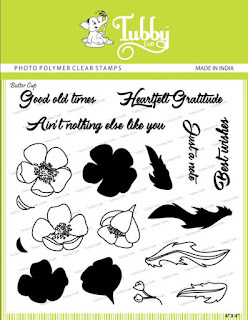 I have used Tubby Craft Dye inks Jet Black, Lawn Green and Light Pink for stamping and colouring. 2. Then adhered all the fussy cut elements on to the card to create some layers using double side foam tape. 3.Then added a beautiful sentiment to finish the card. By joining our challenge you can win some amazing prizes and have lots of crafty fun!! Stay tuned for loads of amazing inspirations and creative tips with Tubby Craft.